Overview… the privileged son of wealthy but troubled parents. At 17 years old, Charlie seems to be much more of an adult than the actual grown-ups that surround him. The mostly friendless Charlie has spent most of his teenage years drifting in and out of private schools. On arriving at the local pubic school, he concocts a scheme to make friends and help out his peers: he exploits his family psychiatrist in order to acquire prescription drugs for his fellow students. Personality… brainy, eloquent, and charismatic. Charlie is the closet thing to a grown-up in a teenager’s body. Regardless of his modesty, he’s not “just a stupid kid,” as he claims, but a wise and mature young man trying to come to grips with his own place in the world. 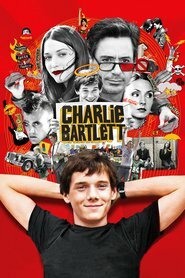 Charlie Bartlett's popularity ranking on CharacTour is #3607 out of 5,000+ characters. See our top-ranked characters and read their profiles.